“The project took what was a sea of asphalt and turned it into a place where people want to be, where it is safe to walk and where stormwater is no longer collecting from Main Street, down East Spring Street and running off into Glen Park but being collected in planters prior to being released,” Lynda Juul, Williamsville, N.Y., administrator, said. To start the project had to be identified as a priority in the village’s comprehensive plan. 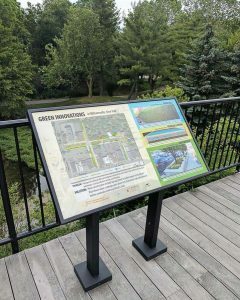 Further planning was completed between 2007 and 2017 and the “Picture Spring Street” initiative was launched in order to educate the public and generate feedback. A project charter was adopted by the village board of trustees and it formed a 48-person committee. Several rounds of funding were pursued requiring coordination and planning among various officials, consultants and higher elected officials. Request for proposal processes were gone through in an eff ort to seek multiple private sector partners before the current owner, Sweet Jenny’s Ice Cream, was identified and selected. The project secured funds for green infrastructure and streetscape with permeable pavers, a subsurface water filtration and collection system, bioretention swale and included a build-out of the public plaza area and creation of an inviting gathering and event space. The overall goal for the East Spring Street Project was to take an underutilized road and transform it into a vibrant “B street” of activity. The timeline estimated was that everything would be completed between the spring of 2015 and the fall of 2016. After it was completed, the transformation would serve as a model of both green infrastructure and stormwater management. 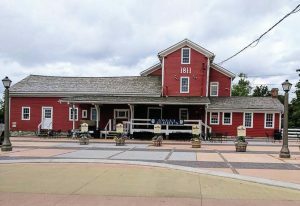 This project would then allow “dead areas” to become a hub of activity all centered around the restored 1811 water mill, including a village square pedestrian plaza where residents could hold a farmer’s market or other events. 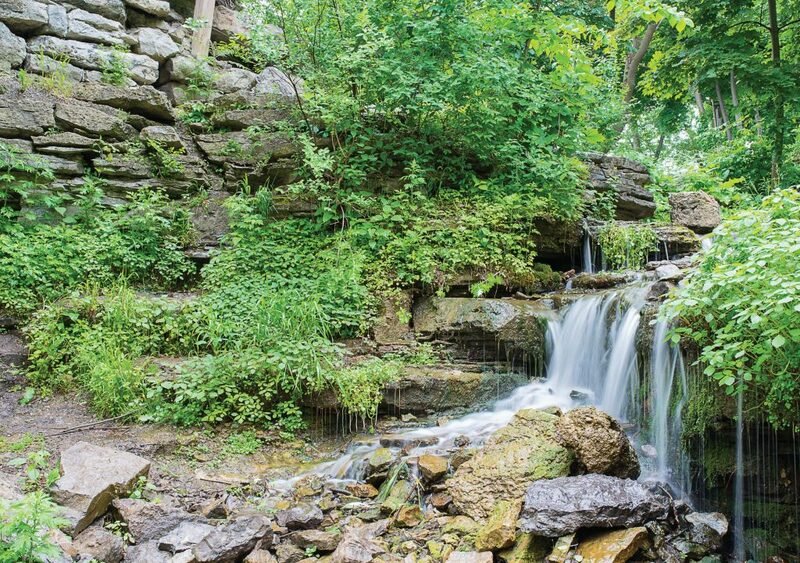 Here, in the heart of the village, there would also be opportunities for small shops and infill development near the rushing waters of Glen Falls. Large scale green infrastructure was planned for this project, which would utilize traditional gray functions such as pipes and drains but allow the majority of the stormwater to be captured and released back into groundwater aquifers, such as wetlands, retention ponds and bioswales, after undergoing natural filtration. Previously stormwater management involved the water flowing directly over the top of the bedrock ledge at the mill to the creek below. This would then cause erosion of the bedrock and extreme sedimentation of the creek. In order to reduce the impact to both, the new design featuring green infrastructure was built. 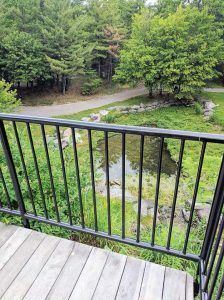 The site’s rock depth was deep enough that it allowed water to be slowed and cleaned in the rain gardens before eventually outfalling beyond the mill to Ellicott Creek. Runoff easily escapes over the edge of the bedrock ledge where the mill was thanks to the steep slopes of East Spring Street. In order to decrease the amount of water flowing over the edge, particularly during large storm events, a series of rain gardens were placed on the curb edge of East Spring Street. Curb inlets allow stormwater from the street edge to enter so that it can then be directed to the planting medium. Sidewalk stormwater can enter also with the help of wall inlets. When the area in front of the mill becomes shallower, it allows for a lateral pipe to feed adjacent trees with stormwater from the raised planters on East Spring Street. This means the trees can be planted in structural soil and simply be fed with stormwater. Prior to this project, the roadway had three drainage inlet structures that were clogged and not functioning properly. As part of the project, those lines were cleaned so that surface water could drain to these structures. The outfall for these pipes can then be directed to a series of terraced rain gardens as part of a bedrock wall stabilization effort. Water from drainage inlets and excess water from raised planters along East Spring Street is slowed down and cleaned by the terraced planters before emptying into the creek area near the mill building. The north and south sides of the roadway are lined with rain gardens. Several rain gardens on the south side of the street catch water diverted from parking areas. Water that gets past these gardens is channeled to the rain gardens on the north side of the road. Shrubs, perennials and grasses are planted along the south side rain gardens in order to emphasize that side of the roadway’s pedestrian walk. 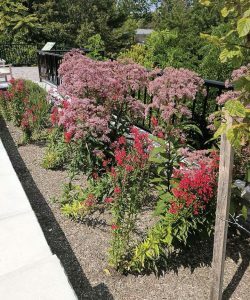 The north side rain gardens include trees, shrubs and perennials, which allows the view and feel of the park to extend into stormwater management. On Rock Street rain gardens and green spaces will better define pedestrian walkways while also providing necessary stormwater management. These gardens are able to rely on infiltration as well as overflow piping from the previous stormwater system. In order to help collect stormwater, a greenwall was installed adjacent to the mill. Sidewalks, street lighting and an overlook looking into Glen Park were also installed. The success of the project can best be seen in two ways. In 2017 the American Public Works Association New York chapter awarded the East Spring Street Project the environmental project of the year award. Officials are also using this technique on more streets throughout the village. 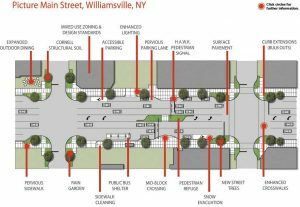 “Currently the village is undertaking a similar green infrastructure project on South Long Street and Village Square Lane, restoring the right of way in an area surrounding a village park,” Winship concluded. In 2005 the village paid $450,000 with no technical match to the grants. A $50,000 grant was received from Senator MaryLou Rath through the NYS Parks. Assemblyman Jim Hayes also assisted in providing a $50,000 grant. The NYS Parks also provided a grant in the amount of $150,000. In 2016 the water mill was sold to Sweet Jenny’s Ice Cream, which currently holds an ice cream shop and comic book store. In 2008 a restoration grant was applied for, and $100,000 was awarded through a Environment Protection Fund grant. These EPF grants require a 50/50 match. In 2009, the EPF awarded $97,210. The EPF grant then awarded the project $244,824 in 2010. The New York State Department of Environmental Conservation Water Quality Improvement Program grant provided $1,902,180 with a $634,060 match. The NYS Environmental Facilities Corp. Green Innovation grant provided $799,160 with a $88.796 match. State Senator Michael H. Ranzenhofer secured $250,000. A grant to build out the public plaza area provided $250,000, which would also create a space for gatherings and events. In order to complete the stabilization and restoration of the historic water mill, a$500,000 grant was received from the State Historic Preservation fund.